Algunas ideas son realmente para se difundir! Llamaran a los más destacados oradores de la ciudad: Los Taxistas de Buenos Aires para hacer que las ideas de TEDx lleguen a la gente común! This story really touched me. “Relationships are important in education… and really maybe even the key to teaching is the relationships we have with the students… if you are able to touch their minds, fine.. but if you can touch their hearts..than the mind contact last longer and goes deeper I think” by 4th grade teacher John Hunter, while introducing his creation called: The World Peace Game. John Hunter managed to put all the problems of the world on a 4′x5′ plywood board and challenge his 4th-grade students to solve them. 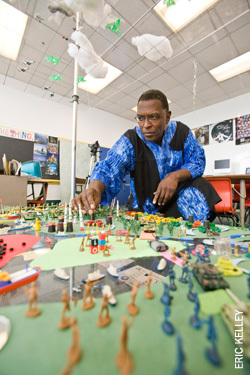 The World Peace Game is a hands-on political simulation that gives players the opportunity to explore the connectedness of the global community through the lens of the economic, social, and environmental crises and the imminent threat of war. The goal of the game is to extricate each country from dangerous circumstances and achieve global prosperity with the least amount of military intervention. In essence, as meaning is constructed out of chaos and new creative solutions are proposed, the World Peace Game players will learn to live and work comfortably at the frontiers of the unknown. Beliefs and values will evolve or completely unravel as they begin to experience the positive impact and windows of opportunity that emerge through effective collaboration and refined communication. At TED2011, he explained how his World Peace Game engages schoolkids, and why the complex lessons it teaches — spontaneous, and always surprising — go further than classroom lectures can. His work is featured on the film: “World Peace and other Fourth-Grade Achievements”, a production of Rosalia Films, www.rosaliafilms.com, directed by Chris Farina a thought provoking documentary filmmaker.